Weather: Hot, a day where the sun felt like it was beating down on us. Up to 21°C. We have had a fair few days of very windy weather this year, and even when the garden was being blown apart. 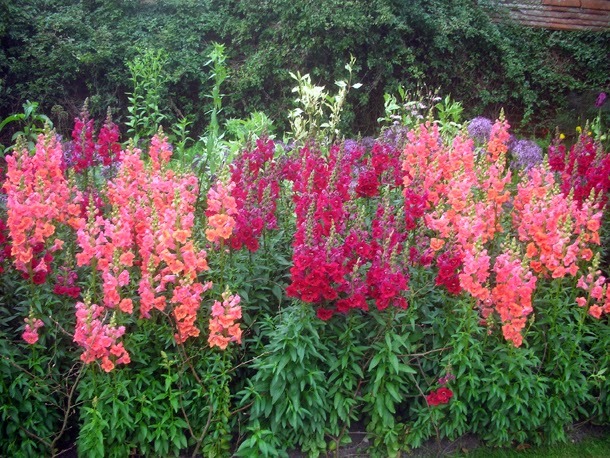 These Antirrhinum majus 'La Bella Bronze & Red Series' remained proudly standing and barely ruffled. I worked with James and Siew Lee. 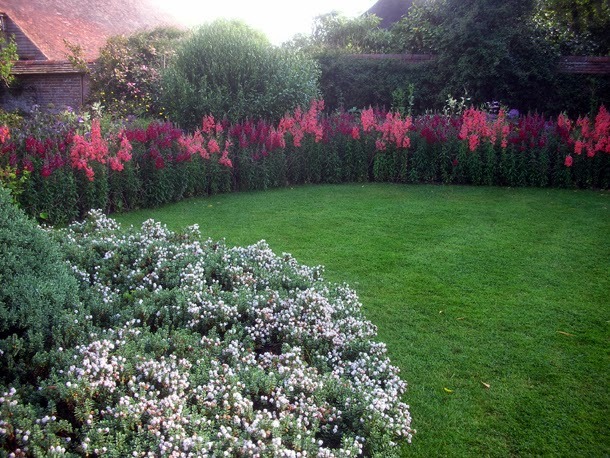 We placed boards over the lawn and methodically & almost meditatively we went through the whole bed taking out all the snapdragons and peasticks. Some of the better peasticks we saved, in case we needed any that season, and 10 - 12 strong plants of each colour of antirrhinums, which we put in recycled compost bags in crates. We dug out and collected bulbs of Tulipa 'Daydream' to store away for winter and then dug the bed over very thoroughly, so that it was a lovely fine tilth. We looked at what stock we had and brought up a handful of things to try out, including a lot of Salvia Splendens 'Bonfire' and 'Flares' (shorter than 'Bonfire') which we had originally grown with that area in mind, Coleus palisandra and Erigeron annuus. We played around with these and made different combinations, even laying them out fully to see what they would look like. The Coleus palisandra although a wonderful deep dark purple plant, we decided was too dark, it seemed to just absorb colour and just got lost in the planting, and we didn't have enough of it to make something of it. with a lot of flowers and is also a bit brighter. 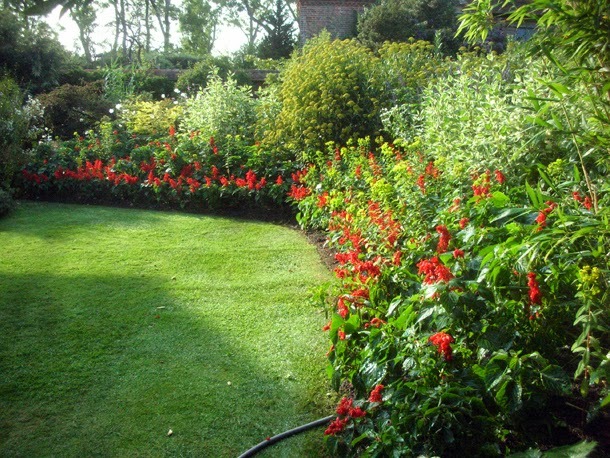 In the end we decided to definitely start placing out the taller Salvia splendens 'Bonfire' at the back. Then using this one and 'Flares' we tried to create an undulation of red. This type of Salvia would not usually be my obvious choice, my first gut reaction to them I had to admit was that I found them hideous, but I always like to challenge feelings like this. If anywhere can do it, it is Dixter who can show me how a typical council bedding plant can be totally subverted and made into something extraordinary. And it was not an exception this time. Even I could see what an amazing impact they made when they were all lined out. We laid them out in the bed, then Fergus came and gave his magic touch and made them even better. Then he had the idea of putting some Euphorbia donii amongst them. Surprisingly the bright lime green of the euphorbia actually seemed to mellow the colour of the salvias. 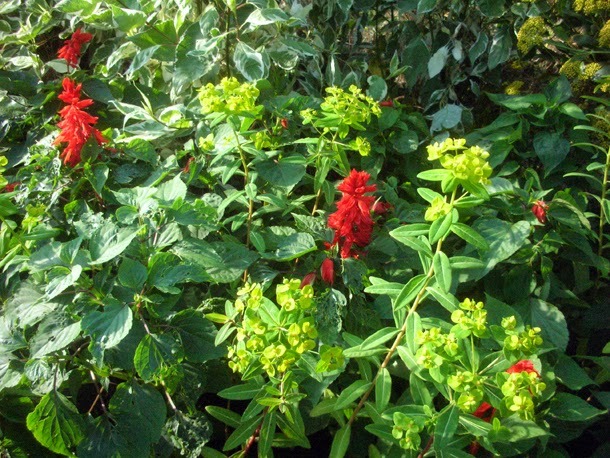 Close up of Salvia splendens 'Bonfire' and Euphorbia donii. In the end we decided to plant some Erigeron annuus at the back at various spots, to spray out. 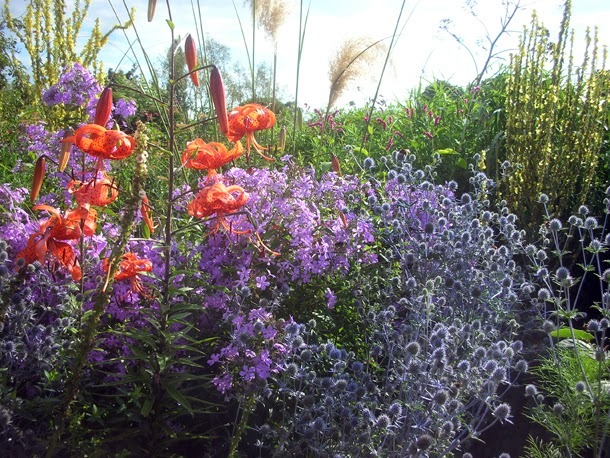 The whole planting is very experimental - it is to be seen how long the salvias and euphorbia will last, and it is an area where we want the plants to go on for as long as possible. The Solar Garden bed after planting. Today we went through the garden stock, getting rid of, weeding, tidying up and organising. Siphoning off excess for sale in the nursery and to donate to Northiam Horticultural Society. 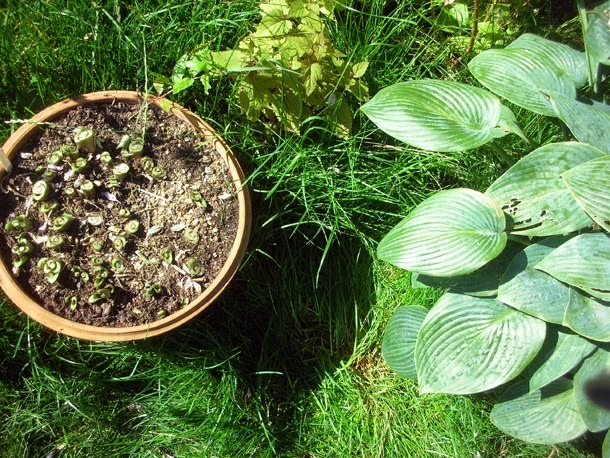 As a trial we did some radical cutting back of some very well furnished Hosta sp. Weather: Sunny, up to 22°C. Still going through the garden stock, including repotting a monster sized Geranium maderense. We left any dead stems as they help to prop up the plant. We organised a lot of unknown Hedychium and was able to at least identify Hedychium forrestii as they have slightly hairy leaves. 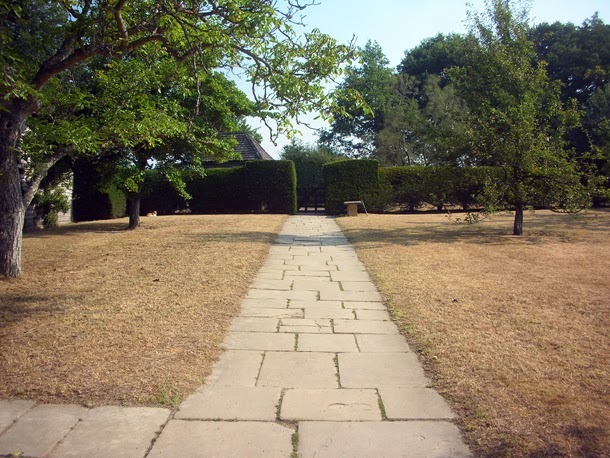 We did more freshening up of the kitchen driveway by weeding and taking out brown bits. Weather: Dull in the morning and hot later in the day. The meadows have started to be cut in the last week or so. It signifies the approach of autumn arriving, which though beautiful in its course is melancholic. I can't help for it to reflect my sadness for the eventuality of my leave and the end of my scholarship here. 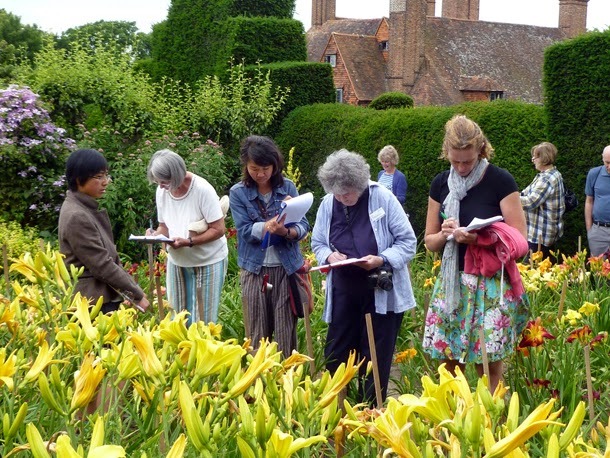 But that is because I have had a good time here, it is part of the cycle, it is an end as well as an exciting beginning where I can't wait to take the skills I have learnt at Dixter out yonder. Maria Castro who is the current HBGBS trainee at Fulham Palace and my peer has come to work with me at Dixter this week, and it was great to have someone with so much energy. 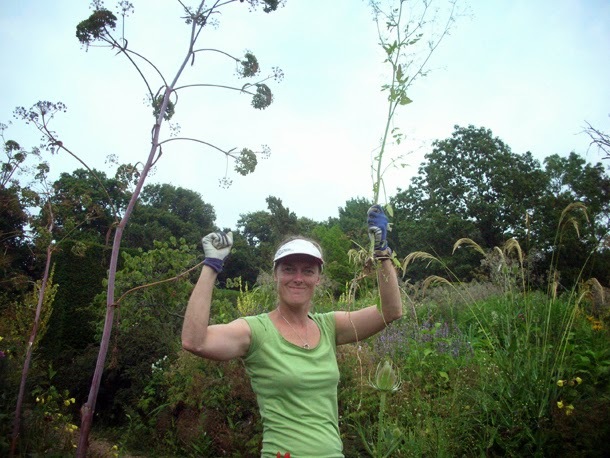 We did more staking in the Exotic Garden - more Eupatorium capillifolium, Amicia zygomeris and Dahlia australis. And took out overly brown leaves of Musa basjoo and Tetrapanax papyrifer. The routine has started now, where every gardener is assigned an area to brush up and deadhead up until the garden closes again for winter. 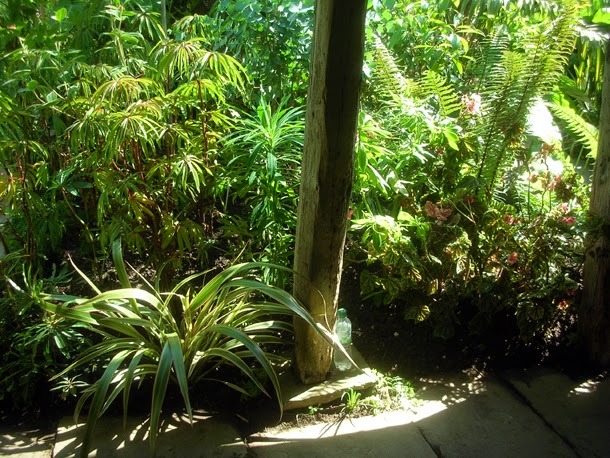 My responsibility is the Exotic Garden - a full circle to where I began when I started my scholarship. 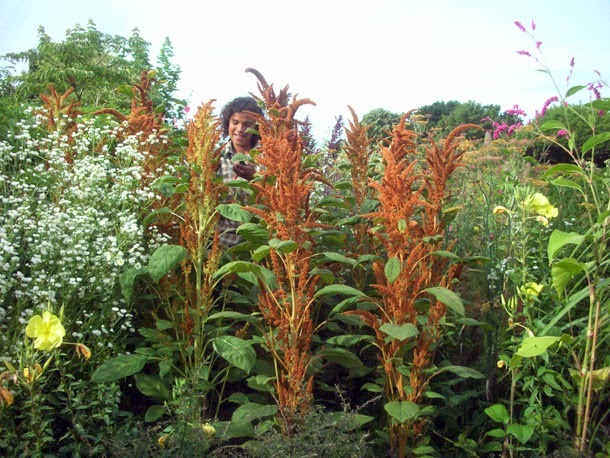 After that we staked up some Amaranthus 'Autumn Palette' in the Peacock Garden - this is a great amaranthus, as it starts off a light rusty orange and goes deeper, darker and more prominent as it matures. Weather: Hot, bright and sunny. 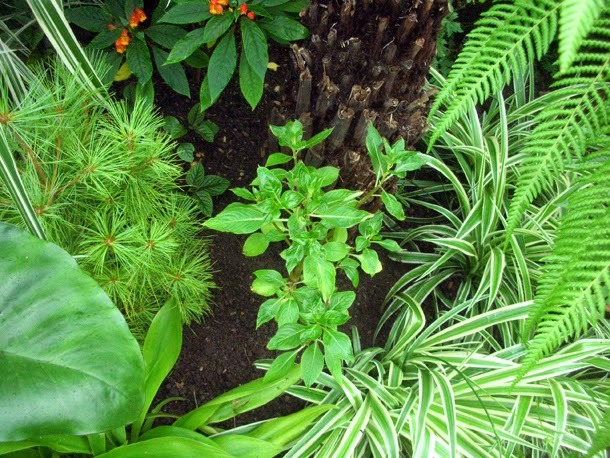 We planted in the last layer of the Exotic Garden to 'furnish' it. First we laid out a selection of plants underneath the cow shed next to the Exotic Garden, mainly from the greenhouses, so we could see what we had for our palette. 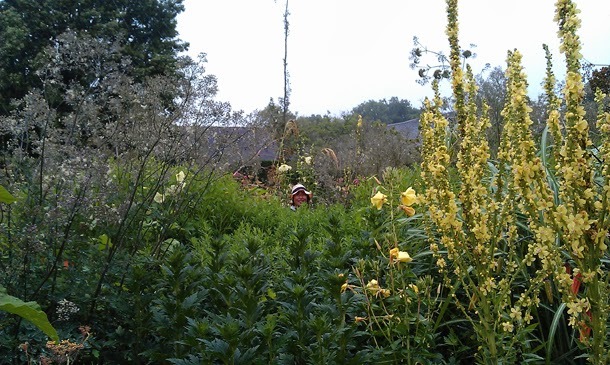 We planted in Hedychium sp, Tibouchina urvillieana, Musa Basjoo, Tagetes lemonii 'Martin's Mutant'. ferns including Adiantum sp. Weather: Changeable but comfortable, moments of sun and overcast. Up to 20°C. 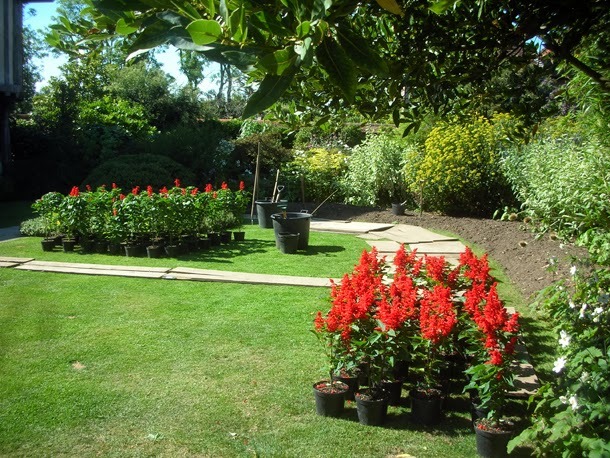 We also replaced a Impatiens bicaudata, as the previous one that had planted had become sick and dying. 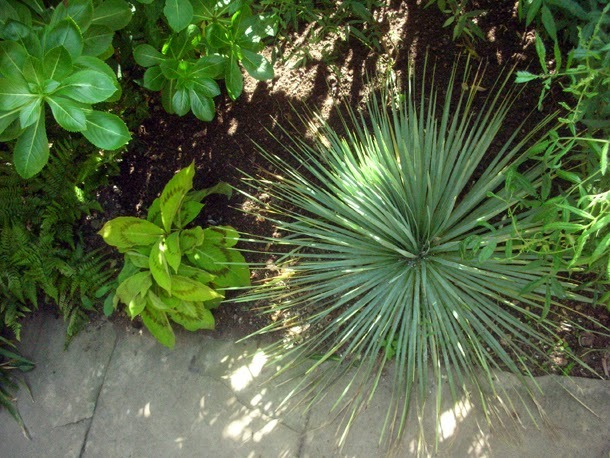 The beds in the Exotic Garden is like mounds, so when we are planting at the edge, we dig a sort of diagonal hole down and tip the plants forward, so that it sits more naturally. We helped Fergus but mainly observing him plant out Gazania sp. and Tagetes cinnabar in the High Garden. It's always a pleasure being able to see Fergus at work, as he's so fast yet precise & intuitive. He trimmed the Tagetes in a way that created an undulation which is highly unusual, but it works! For a section next to it we brought up some Tagetes patula 'Cinnabar' from the garden stock in the nursery, and positioned them out ready for planting, using stakes and string to make a temporary structure to prevent them from falling down. Weather: Warm. Up to about 22°C. 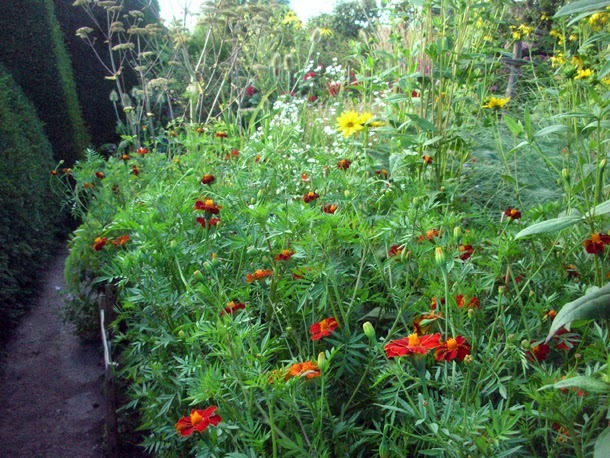 We planted in the Tagetes patula 'Cinnabar' we had 8 or 9 plants and had to bring up almost the double again, space always absorbs more plants than you think. The patch of Tagetes Patula 'Cinnabar' that we planted. James gave a talk on his Japan exchange at the Millenium Park Forest over lunch. Then we weeded the much needed back of the Education Room, where it is still a rough space, where excess garden & nursery stock has been temporarily planted, and where students like me can use to grow their own - I have been using it as a space to grow a few bits of my own vegetable and to do plants experiments (growing things that I have never grown to see how they grow). Weather: The nice summer weather continues. I started the day with my morning routine of brushing up and deadheading the Exotic Garden. As we had finished the last main level of planting in the Exotic Garden we put all the unused plants back. 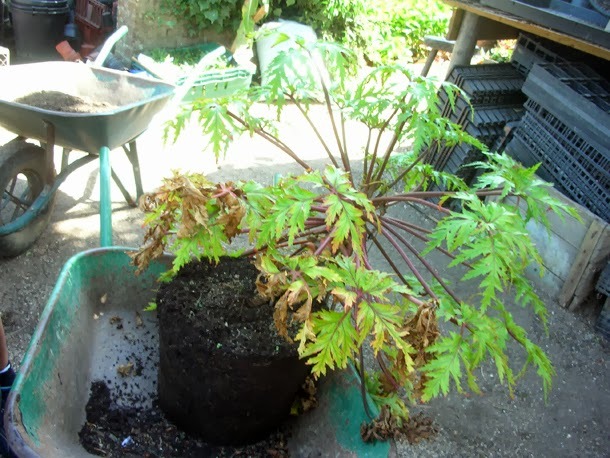 Then we repotted some Begonia grandis subsp. evansiana. Right in the midst of the jungle. It was very windy and we had to do emergency staking all around the garden of plants that would be affected and that we had not got round to staking yet. So we went round stabilising all Verbascum olympicum & Verbascum 'Christo's Yellow Lightning'. It was a rare opportunity to go into the middle of the beds at this time of the year, which are so dense that it was quite a feat to go in and out of them and for them to remain looking undisturbed. It was great to see the border/ garden from a perspective that one usually doesn't get to see - gardeners get the best perspectives. 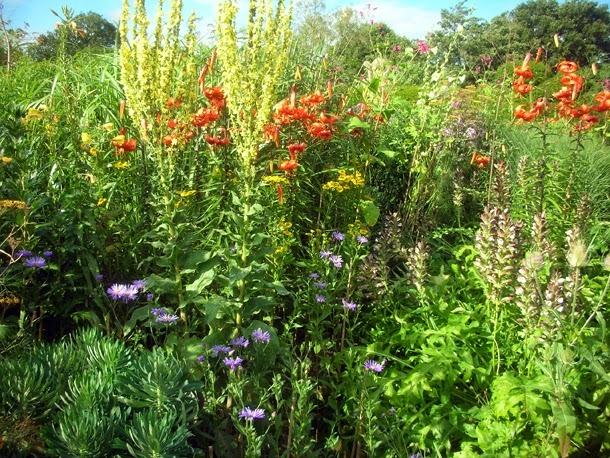 View within the border, well and truly surrounded and encompassed by plants. For the stakes we malleted in short chestnut poles, recycled broom handles or thick canes, then tied two sets of tarred twine around them, using the clove hitch knot and figure of 8 technique around the plant. Then I went to stake a Cosmos bipinnatus 'Purity' & Rudbeckia sp. The rudbeckia was actually fine, but we were just pre-empting its need for support soon. 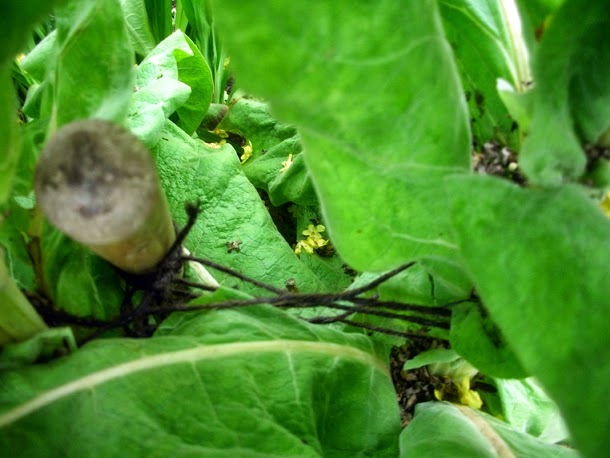 With these we used the usual staking method (just with usual green twine and a single string around the plant). We don't use many varieties of Cosmos, only tried and trusted ones, as we demand from them to be tall and evenly floriferous, and not many are. 'Dazzler' & 'Purity' are good reliable ones, and I have seen 'Candy Stripe' doing very well at Gravetye as well. 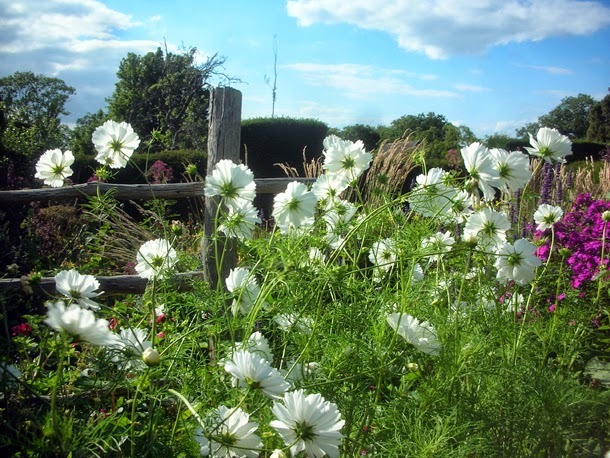 Cosmos bipinnatus 'Purity' on a good day, with its billowy grace. Weather: Fairer, more still weather. We decided that the string tying I had done on the Cosmos & Rudbeckia was too high and now as it was easier to see (not fighting against wind and drizzle) I went to adjust them. Then work started again in the Exotic Garden. Weather: Really hot up to 28°C. 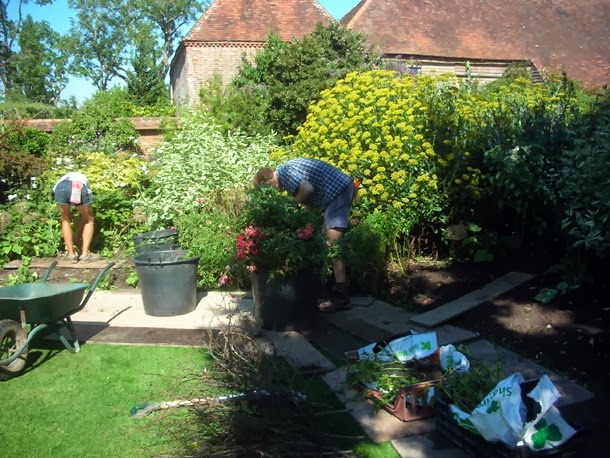 In the Exotic Garden we are now preparing it for the third and last layer of planting - thinning out more Mysotis sylvatica 'Royal Blue' and Verbena bonariensis and staking Eupatorium capillifolium & Impatiens bicaudata. Weather: Cooler, up to 20°C. Cloudy & overcast most of the day, slightly humid but not uncomfortable. More weeding around the Hemerocallis trial bed. Many have had their moment now and are over. Weather: Up to 22°C but felt hotter. I did some planting throughout the Long Border and plugged some gaps with the Dixter classic Tagetes patula 'Cinnabar' and some Geranium × riversleaianum 'Russell Pritchard'. I cut back some spent Geranium pratense leaves, and took out some spent Centaurea cyanus 'Blue Diadem', that still had a lot of colour going for it and had only just turned. 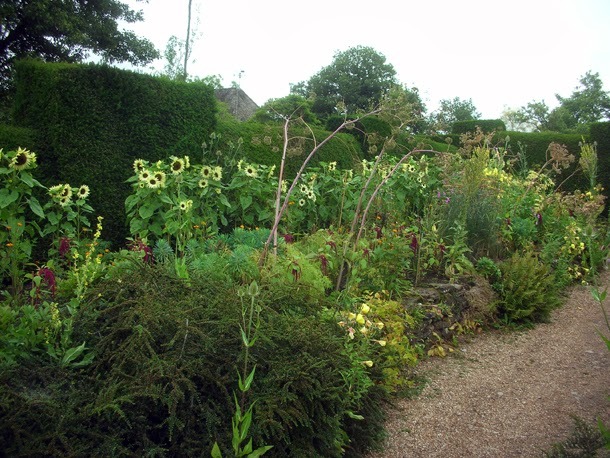 Some tall Silphium perfoliatum at the back of the Long Border was leaning onto the yew hedging. 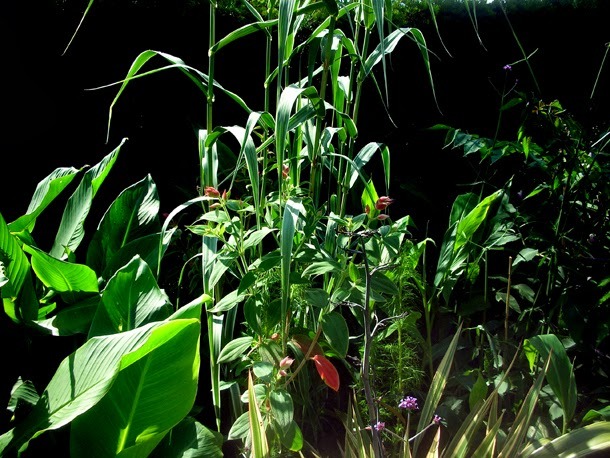 So I drove some tall stakes at intervals behind the mass of plants and threaded a none slip rope between them, to prop the silphium up. Weather: Hottest day of the summer so far, apparently up to 34°C! Me and Ellen finished clearing the space behind the Lupinus arboreus in the Peacock Garden, including taking out weeds and digging it over. Then we planted in Cosmos bipinnatus 'Dazzler' - a tall dark carmine pink one and watered them in well. Meanwhile setting the sprinkler on the Aster latiflorus var. horizontalis hedges. At the back of the Peacock Garden near where we planted out the Cosmos. (Left to right) Lilium lancifolium, Phlox sp. Eryngium sp. 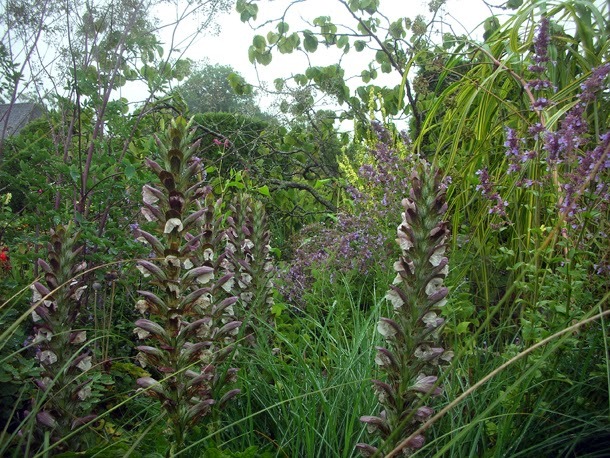 Behind these are bright pink tufts of Persicaria orientalis and Verbascum sp. Weather: Thunderstorm - first rain in weeks, heavy showers but it didn't last long. We cleared one side of the kitchen driveway, weeding and taking out dead/ brown bits. We collected some Leucanthemum vulgare & Papaver dubium subsp. lecoquii 'Albiflorum' (Beth's poppy) seeds. Then we cut back the dead stalks of these, and of Euphorbia sp. & Geranium sp. We saved the offcuts of Leucanthemum vulgare & Geranium sp. 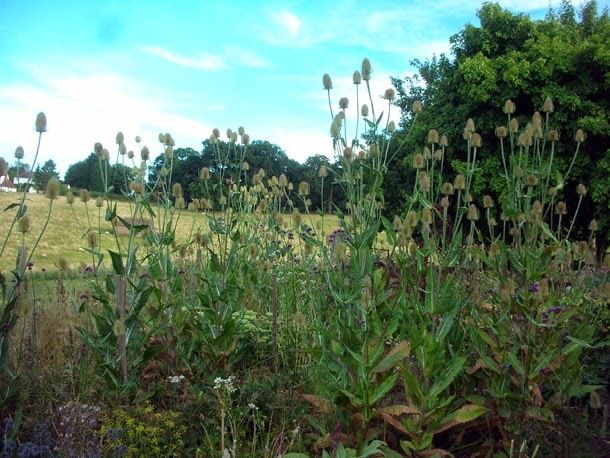 that still had seed heads, and took them down to the farm complex to strew in cracks and barrens spaces there. Weather: 24°C, mainly sunny. Nice and cool in the morning, especially moments when it was overcast. Fergus was away today and he left us to do a juicy bit of planting by ourselves in a sizeable bed on the kitchen driveway that we had just cleared. This is really exhilarating because he usually likes to inspect the different stages of how we place out the plants and how they look after they have been planted, as he wants to keep a tight unity over the garden. So it's a quite a honour to just be left with a task like this, naturalistic planting can be quite hard and it's a great challenge. He did indicate what he thought we should plant out there - Amaranthus caudatus (Love Lies Bleeding) and Tagetes patula, but it was pretty much free reign of what we did with it. 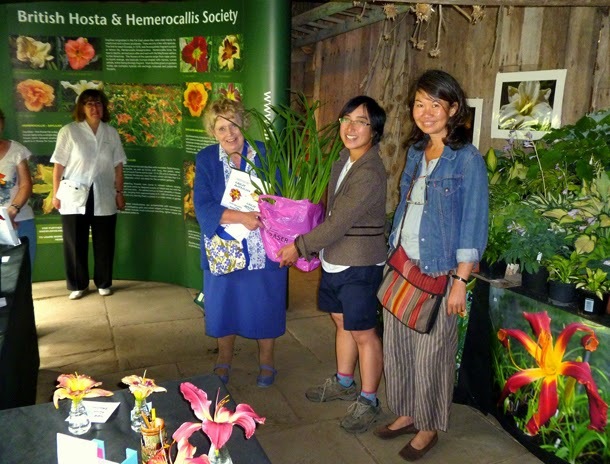 So with excitement and intrepidation I worked with Ellen & Yuka to place out plants, getting experienced opinion of gardeners like Graham who has been there for a few years. Ellen had a great eye (she is from a graphic design background, is currently training in garden design and is this years Ann Wright garden design scholar at Dixter), and we worked together well intuitively. We had done a good stint together already planting out the Cosmos on Monday, she has also been giving me amazing assistance with my Hemerocallis project. Yuka valiantly accepted our choices and contributed her commitment to ambitiously get it planted out before the end of the day (it took us the day just to get all the plants and to position them). so striking you don't need much to make an impact. Weather: It was cooler today - up to 24°C. More overcast moments & cool winds, the optimum weather to work in. Our planting was rated by Fergus! In fact he paid us a high compliment (not given lightly), that we had planted it out better than he would have done?! As you can imagine we were over the moon. 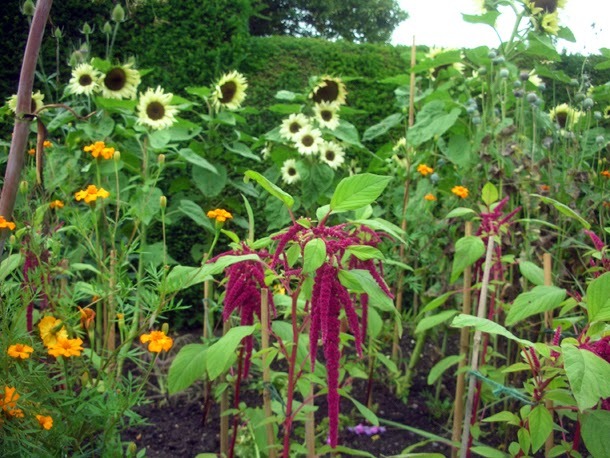 So with gusto we went round 'finishing' the area off, weeding, staking all the sunflowers, tagetes and amaranthus and tickled the soil of the whole bed to a satisfying finish. I also gave a tour to the volunteers & workers of Dean City Farm. Weather 23/24°C. Sunny with intervals of relieving clouds and breezes. After out epic plant challenge, we were each individually given our own small patch to plant up by ourselves. Mine was a sliver of bedding in one of the Peacock Garden beds, which I planted up with a yellow Helenium Sonnenwunder & Aster × frikartii ‘Mönch’. 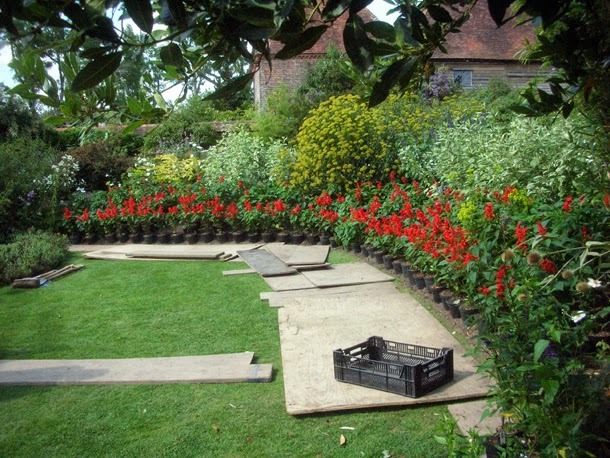 It is customary for us to place out the plants in the positions we want them before planting, and its usually a tight border space with lots of other plants going on, so one usually has to manoeuvre between what is being planted and what is already there. Sometimes the space is really tight, so one has to remove the plants mark (with canes) where they are to go and reposition them back in as we plant them. When you're dealing with different sized plants you also have to strategically think about how they are facing and are placed in relationship to each other and how big they are going to get. For example to make sure tall or bushier ones don't end up obscuring small, thinner ones. The general goal is to get them sitting there looking as comfortable as possible. The heleniums were hard to work with as they had gotten too big for their pot and were very brittle and had a tendency of toppling over as you position them. 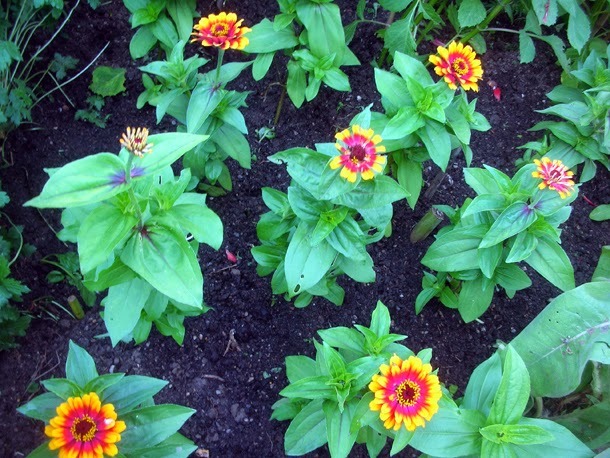 What the Helenium & Aster planting looked like a few weeks later.